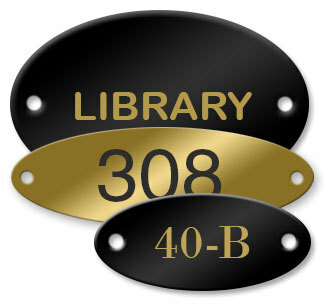 Brass Tags Engraved Oval .020"
Laser engraving Black Color Coated Brass removes the color coating and leaves a marking which is the natural brass color. Laser engraving Gold Satin Brass tags engraves the tag with a laser darkened image. The pin-point laser engraving technology allows for a clear, easy-to-read marking which can include greater art detail than traditional rotary engraving.